V Card Las Vegas is a nightclub hopping package. 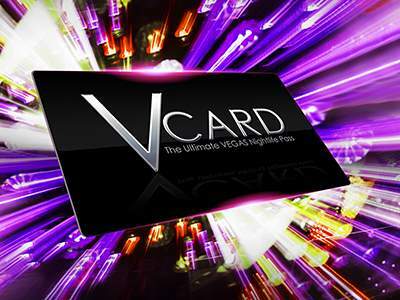 Many people ask this question - is V Card worth it? If you enjoy club hopping, dancing and night life in general, then you definitely need to get it for your trip to Las Vegas. For one very low price, you can visit multiple participating night clubs, strip clubs, pool parties and bars and justify the cost of the card by visiting only 3 venues of your choice. Many nightclubs are participating in Las Vegas V Card. Do women need a V Card Las Vegas package? Women can often get into a club for free. However, if you are in a company of men, I recommend getting a it for everyone so you won't have to stand in the line while they guys are already in. Or get a What Women Want Pass (described below) where the V Card is already included. If you are traveling with a bunch of girls, you don't really need it. There are several limitations - for example, some passes must be used before 12:00 pm. One important limitation for Gentlemen's clubs is that if you arrive to a club by taxi or in a hired limousine they won't let you in - you have to to use their shuttle service (and tip the driver) or arrive by your own car. The package may not be valid on certain nights - for example, when someone famous is performing at the club, or if there is a holiday. You wouldn't have to guess though - all the information would be on the back of your card. If you are ready to plan your vacation all by yourself and want to incorporate a night club hopping - then this nightclub package is definitely a top choice! Besides, you don't need to use all the passes during one visit to Vegas - this package is valid as long as the clubs are participating in the program! This nightclub package is especially valuable if you are planning to go clubbing during weekend because the entrance to certain clubs may be free during week days! a Stripper 101 class where they will teach you how to walk and pose sexily and pole dance.